The entries in Interactive Calendar have the option to recur. You don't need to create the same entry every time, just make it recur. You can choose any of the basic recurring settings: daily, weekly, monthly or annually. The upper part of the window contains the initial date settings that you can change. 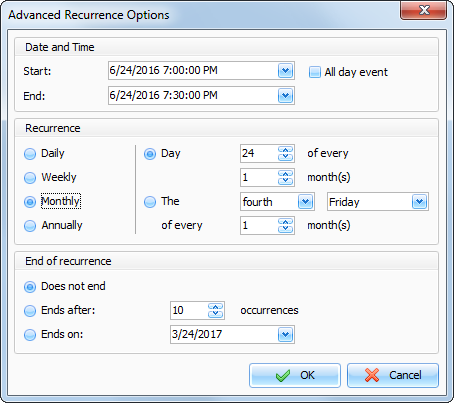 The middle part displays the recurrence details, and the lower part provides the opportunity to set a recurrence period: Does not end, Ends after X occurrences or Ends on set day.